There’s something about Jaipur that makes you fall in love with it. 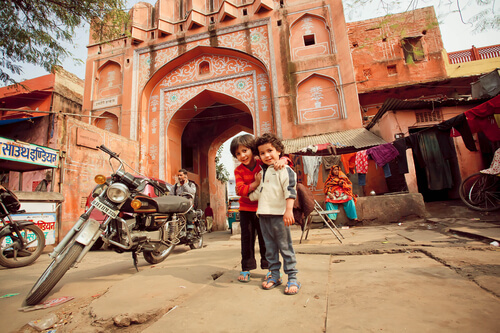 The Pink City (as it’s known), is filled with blushing architecture, a colour which is said to make people feel welcome. Historically, it is also the city where many kings built their castles and these have become a central attraction for travellers. Spoilt for choice, you may not be inclined to visit all the palaces in the city, but there are a few highlights worth seeing. Begin with a visit to Hawa Mahal. Although a familiar sight, the palace is unassumingly located in the middle of a crowded market street. Made from red and pink sandstone, there are close to 1,000 windows lining the stoic, intricately detailed building. The five-storey Palace of Winds (a literal translation of its name), was built so that ladies of the court could peek out at the town below without being seen. With no foundation, it is a structural marvel and has remained erect thanks to its curved shape. Possibly the grandest of all palaces in Jaipur is City Palace or, Chandra Mahal. The Palace was built to greet dignitaries and the Mubarak Mahal is also a resident here. Within the grounds, there are several buildings that makeup Chandra Mahal including other palaces, courtyards and galleries. What piques the curiosity of visitors are four doors that lie in the interior, representing the four seasons of the year. The Green Gate is for spring, the Lotus Gate for summer, the Peacock Gate for autumn and the Rose Gate for winter. Amber Fort or Amer Fort, should also be on your must-visit list. It is both overwhelming and breathtaking due to its sheer size and beauty. If you choose to go on elephant back, a trek up the main area can be quite a royal treat. But be sure to arrive early in the morning: the elephants carry two people at a time and once their quota is filled, they cease working for the day, usually before the afternoon. Just be sure to hold on tight – as the elephants climb the hill they tend to sway from side to side. Once at the top, there’s plenty to explore, but be sure to seek out Sheesh Mahal or the Palace of Mirrors – a large hall with mirrors on all sides. The idea behind the Palace of Mirrors is that a single ray of light, even the flame of one candle, can illuminate the space through its reflection. 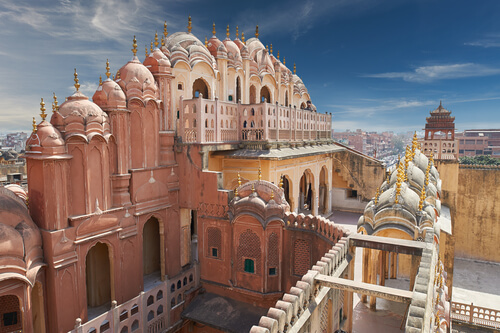 Having walked in the footsteps of past kings and queens, soaking in the rose-tinted sites, you’ll leave Jaipur with a greater sense of just how grand this ancient city is.